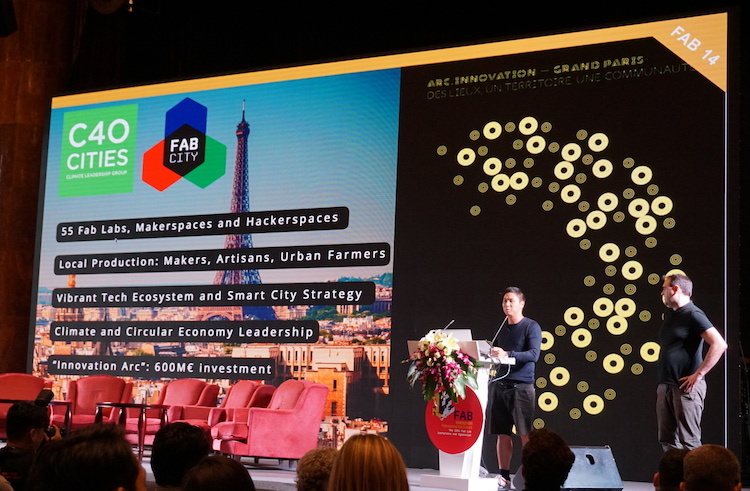 A first in China: FAB12, the international fablab conference, took place on August 8-14 in Shenzhen, the city that produces 80% of the world’s electronics. Hundreds of labs from 64 countries convened around mass fabrication and maker empowerment. And France was chosen to host FAB14! 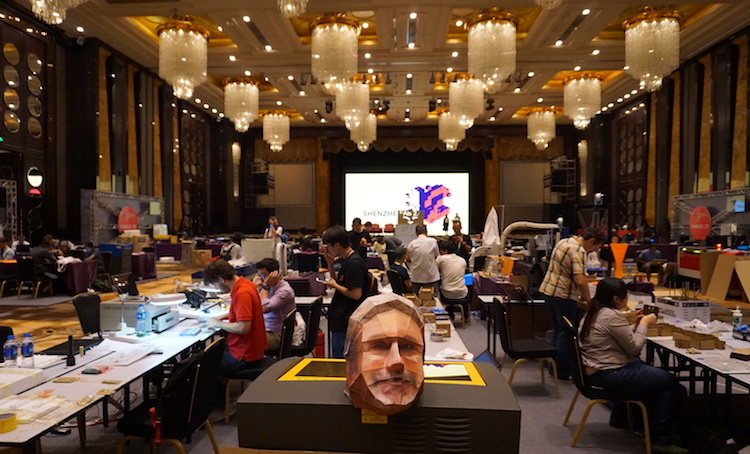 Paper mask of Neil Gershenfeld in front of the Fab 2.0 space in the hall of the Sheraton Hotel. 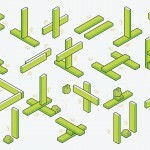 Why Shenzhen for FAB12? Already known as the mecca for makers, given its capacity to sell all kinds of electronic components in retail quantities at wholesale prices, and as the Silicon Valley of hardware for its start-up incubators and accelerators, the city itself is a highly successful example of rapid prototyping. The once fishing village, officially declared an experimental Special Economic Zone (SEZ) in 1980, is now a dynamic metropolis with a population of 11 million, of whom 98% were born elsewhere and the average age barely tips 30, a city responsible for 60% of China’s industrial production, according to official figures, and where, unlike in the rest of the Cantonese province, people speak putonghua, literally the “common language” of China. The dimensions of the exploit seem even more unfathomable when considering the electronics markets of Huaqiangbei, a 3-square-kilometer area in central Shenzhen where shops selling components and devices are stacked up in low ceilinged, windowless buildings. From the famous skyscraper SEG Plaza to Yuanwang Digital Mall, whose vertical density recalls that of Kowloon Walled City before its demolition, behind the counters merchants smoke, drink tea, typing furiously on keyboards, while in the narrow alleyways, children play. Here, each stand is but the tiny storefront for a huge manufacturing and wholesale business of electronic parts behind the scenes. In Shenzhen, a prototyping shop is the size of a factory, a factory is the size of a city… and websites such as Taobao export their products on a global scale, all the way to individual customers. Peruvian weaving space in the hall of the Sheraton Hotel. But how to reconcile mass manufacturing and personal empowerment so dear to the maker movement? According to David Li, co-founder of China’s first makerspace, Xinchejian, in 2010, shanzhai (fake goods) constitutes Shenzhen’s very own folk art—electronics artisans begin by copying a product, but free from industrial restrictions, are free to customize, adapt and improve it. 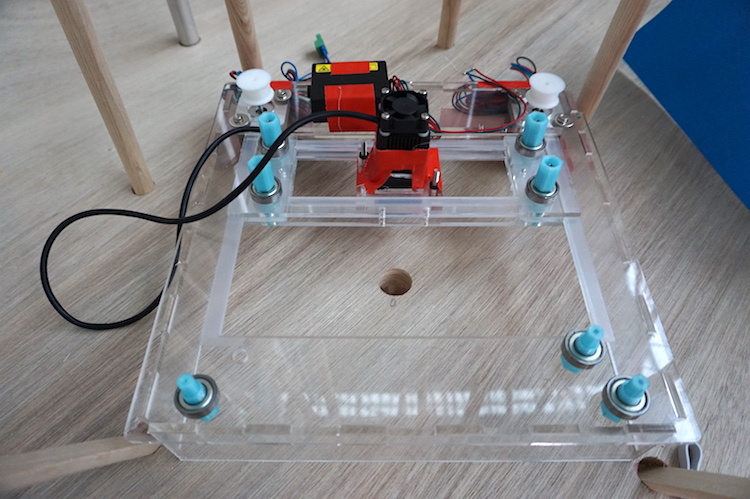 In Shenzhen’s ultra efficient ecosystem, a prototype can be fully manufactured in less than a week. In 2015, following his previous international initiatives Hacked Matter, launched in Shanghai in 2011, and Maker Collider, David Li created Shenzhen Open Innovation Lab (SZOIL), in partnership with a number of institutions and companies in Shenzhen, and in collaboration with MIT’s Center for Bits and Atoms, in order to bring these two cultures of industrial manufacturing and makers closer together. 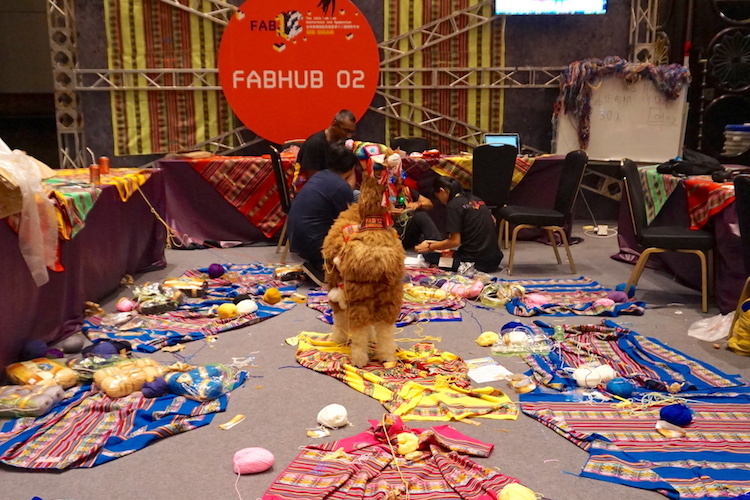 And the mini global village of FAB12 assembled on the 6th floor of the Sheraton Hotel opened the dialogue during the most international event in the history of Shenzhen. After its Maker Faire 2014 and its Maker Week 2015, it was about time these two worlds met on the scale of a symposium. Meanwhile, SZOIL has become the first Asian member of the global Fablab2.0 network. Fab 2.0, Fab 3.0 or Fab 1.75? 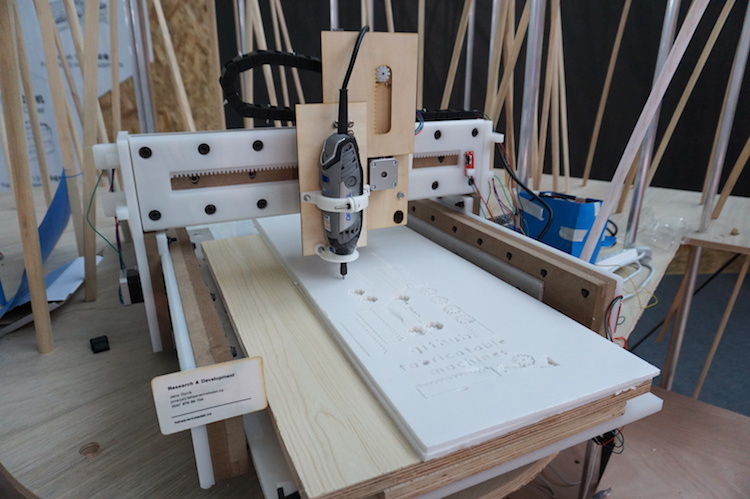 One of the machines built in the Fab 2.0 workshop, developed by Jens Dyvik of fellesverkstedet.no. Faced with this paradox of excessive fabrication at the expense of relevance, simplicity and universal access to machines, Nadya Peek, professor at the Center for Bits and Atoms, co-organized with Luciano Betoldi from Fab Lab Barcelona the central workshop of FAB12: “Fab 2.0 Making Machines that Make”. The concept of Fab 2.0 is to ally the machine with its application, in order to create ad hoc machines for object-oriented production, and therefore an entire infrastructure that can make almost anything. In other words, each machine is nothing more than a simple configuration of basic elements that are cheap and easily accessible, in order to make something very specific. The space reserved for Fab 2.0 in the center of the hall was a joyful mishmash of laser cutters, high-end 3D printers, giant toolboxes, raw and cut materials, printed parts and rejects, prototypes in progress… In the middle of it all, Fab Academy students tested their final projects while advanced makers built 2.0 machines, along with the volunteer assistance of anyone who wished to join in the workshop at any given time. Jon Nordby, from the Norwegian hackerspace Bitraf, built TapeXY, a personal fabrication machine made of acrylic, whose two axes slide on low-friction tape. Although limited to fine cutting and engraving, the machine is light enough to operate vertically, its materials are easy for anyone to find and buy, and it can be built (and customized to specific dimensions) in any local fablab. 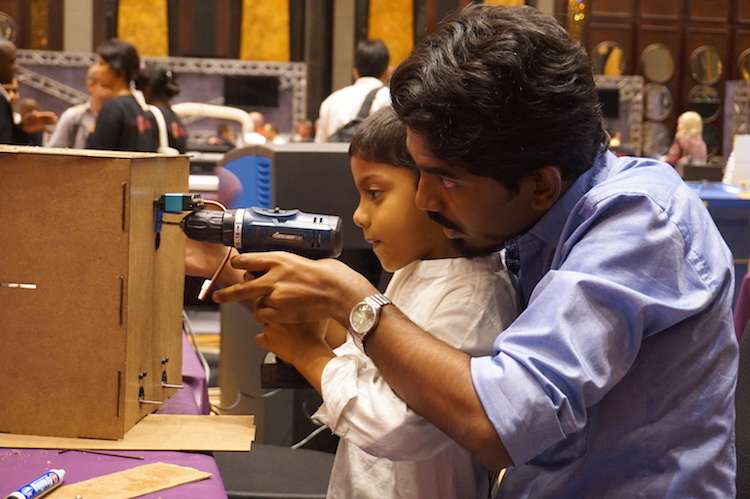 Abhijeet Khandagale makes a cardboard Wall-E with 8-year-old Saarang Sumesh. 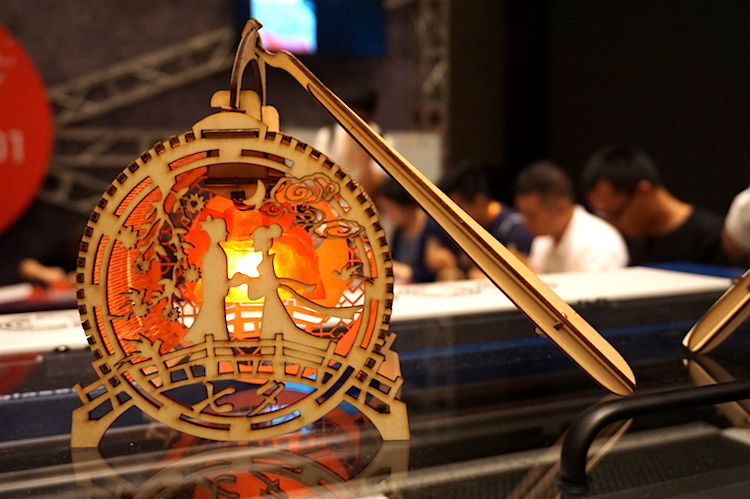 A lamp made in a workshop pictures the two lovers of the Chinese legend. 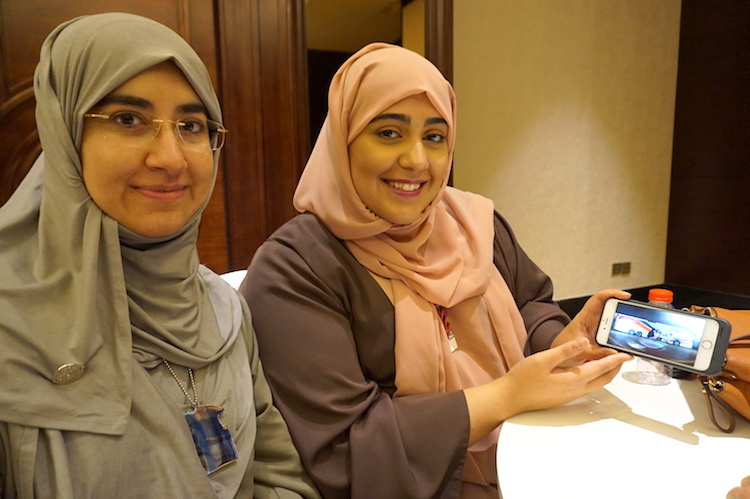 Marwa Ibrahim Sahrawi of Fab Lab UAE and her colleague pose with a photo of their mobile fablab in Abu Dhabi. 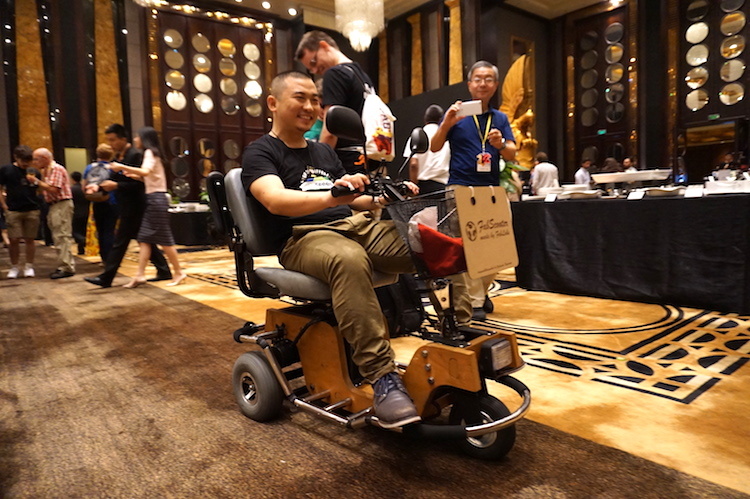 The morning presentations, dedicated to independent and humanitarian initiatives, included the implantation of fablab networks in Kerala (India), Egypt, Rwanda, even in the Amazon (Ecuador)… as well as Yoshisuke Kuramoto, who shared the making of his electric tricycle Fab Scooter, made in collaboration with fablabs in Japan and Taipei, which allowed him to regain mobility after a road accident in 2000. The presentation of Fablab Kamakura brought out the difference in models, from this historical Japanese fablab, which emphasizes community in an ageing society, and the younger fablabs of developing countries, more oriented toward creating future entrepreneurs. Eric Pan, founder of Seeed Studio, takes a ride on Yoshisuke Kuramoto’s Fab Scooter. E-Line Media, a game production company known for its educational and humanitarian mission, not to mention its bestselling game Never Alone on Alaska Native culture, also announced Fab the Game—a soon-to-be released game that will challenge us to imagine, build and manage the post-Fab 2.0 world of the third digital revolution. Neil Gershenfeld made it official: “Toulouse” emerged as the winner to host FAB14 in 2018, thanks to a pitch full of logistical, visual and emotional impact, while strategically playing up France’s gastronomic reputation, to become the unanimous people’s choice. Fabwise, the conference will be held in Toulouse, followed by the festival throughout France and the Fab City Summit in Paris. Meanwhile, rendez-vous in Santiago, Chile for next year’s FAB13. Minh Man Nguyen of WoMa during France’s pitch to host FAB14. Friday’s symposium, on the last professional day of FAB12, reprised the theme of replication in discussions among high-profile personalities in their respective fields: science and technology, businesses that make businesses, organizations that make organizations, civilizations that make civilizations. In terms of fab innovation, planetary physicist Phil Metzger pleaded his case for putting fabrication machines on the Moon in order to save and transform life on Earth. 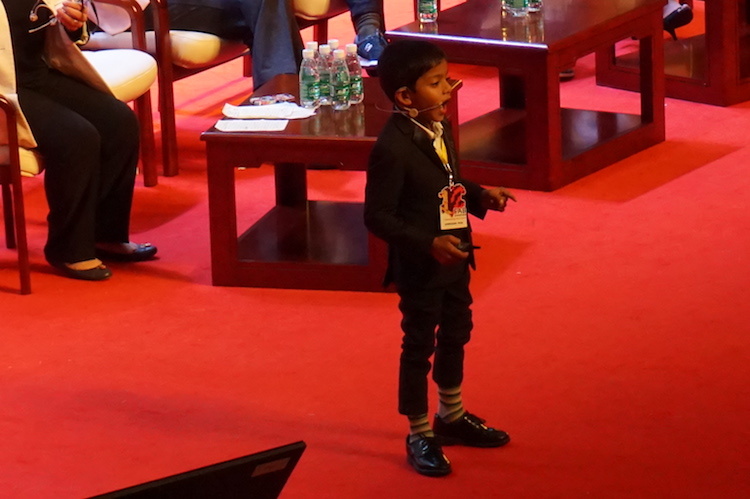 But the most surprising, and perhaps most touching presentation was the talk by 8-year-old Saarang Sumesh from Kerala, who owned the stage and seduced the audience, detailing his personal journey as a maker since the age of 3. Saarang Sumesh, age 8, maker from Kerala, India. Does the future lie in the hands of this new generation of children, far away from the traditional strongholds of Western knowledge and craft, who know how to communicate, share, inspire? Who will be there, 40 years after pushing the infamous Fab City button, to witness the consequences of our actions and the reality of our ambitions? And how will Shenzhen be changed?